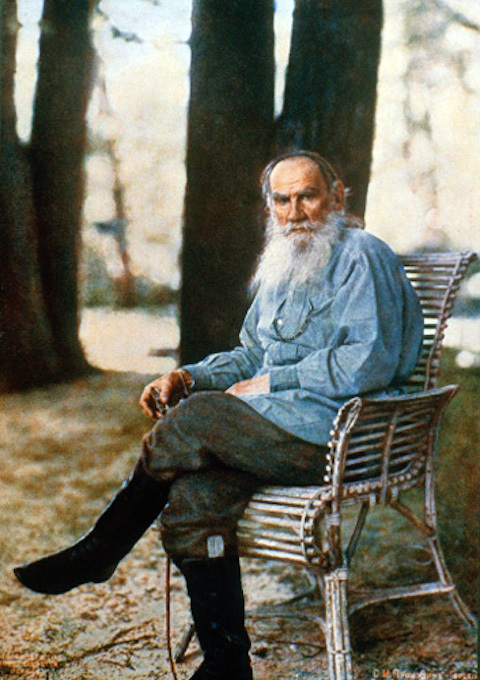 Born 187 years ago today, Russian novelist Leo Tolstoy’s life (1828-1910) spanned a period of immense social, political, and technological change, paralleled in his own life by his radical shift from hedonistic nobleman to theologian, anarchist, and vegetarian pacifist. Though he did not live to see the Russian Revolution, the novelist did see Tsar Alexander II’s sweeping reforms, including the 1861 Emancipation order that changed the social character of the country. Near the end of his life, Tolstoy saw the coming of new recording technology that would revolutionize the direction of his own life’s work—telling stories. Near the end of his life, Tolstoy appeared in the new medium of film, which captured his 80th birthday in 1908, and his funeral procession two years later. He was the subject of the first color photograph taken in Russia (top) also in 1908. And that same year, Tolstoy made several audio recordings of his voice, on a phonograph sent to him personally by Thomas Edison. You can hear one of those recordings, “The Power of Childhood,” made on April 19th, 1908, just above. You’ll note, of course, that the great author reads in his native language. Most of the recordings he made, which he intended for the edification of his countrymen, are in Russian. Below, however, you can hear him read from his last book, Wise Thoughts For Every Day in English, German, French and Russian. The book collects Tolstoy’s favorite passages from thinkers as diverse as Lao-Tzu and Ralph Waldo Emerson. As Mike Springer wrote in a previous post on this recording, “Tolstoy rejected his great works of fiction” as an old man, “believing that it was more important to give moral and spiritual guidance to the common people.” To that end, he made a series of short recordings, which you can hear at this site, on such subjects as art, law, morality, poverty, nonviolence, and capital punishment. Edison asked Tolstoy for many multi-lingual recordings, requesting “short messages” in English and French, “conveying to the people of the world some thoughts that would tend to their moral and social advancement.” Tolstoy diligently made several recordings, some of which were then shipped to Edison in 1908. On February 21 of that year, the New York Times published an article on the exchange titled “Tolstoy’s Gift to Edison. Will Send Record of His Voice—Edison Gave Him a Phonograph.” The world eagerly awaited the world-famous author’s message to its “civilized peoples.” It seems however, that the message never arrived. According to Sputnik News, the fate of that legendary recording “has yet to be found out.” Nevertheless, thanks to Edison, we have several other recordings of Tolstoy’s very well preserved voice, the record of a life lived to the end with fierce conviction and curiosity.